HAMÉ s.r.o. is leading food manufacturing company producing durable and chilled foods with tradition going back to the second decade of the last century. HAMÉ s.r.o. offers a great number of products such as for example ketchups, pates, canned meat, ready made foods, vegetable products, mixed fruits, jams, stewed fruit, baby foods, sandwiches and many others. HAMÉ s.r.o. synonymous with durable and chilled food suitable for every customer. HAMÉ s.r.o. is always expanding its manufacturing programme in keeping with the modern subsistence requirements. Current production of over 100 000 tons of ready made foods groups the company together with the biggest Czech food manufacturers. The company markets its products not only in the Czech Republic and Slovakia, but also successfully exports into the foreign markets. 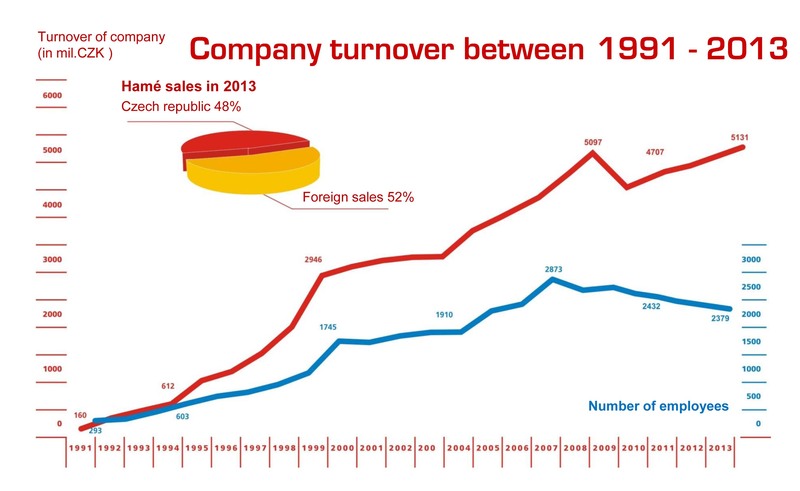 The export share made approximately 50% of the total 5,5 billion CZK gross sales in 2014. Hamé products can be found in more than 40 countries all over the globe, amongst others in Russia, Romania, Austria, Hungary, Bulgaria, Slovenia or Kazakhstan. Other countries include Libya, United States of America, United Kingdom, Israel or Japan. The turnover figures are stated in millions CZK.